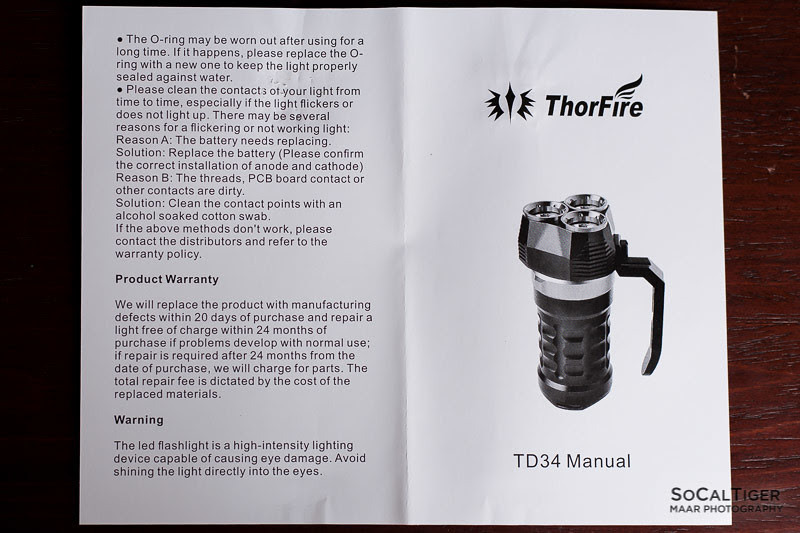 The Thorfire S1 (aka TD34) is Thorfire's 3xXP-L 4x18650 diving flashlight. 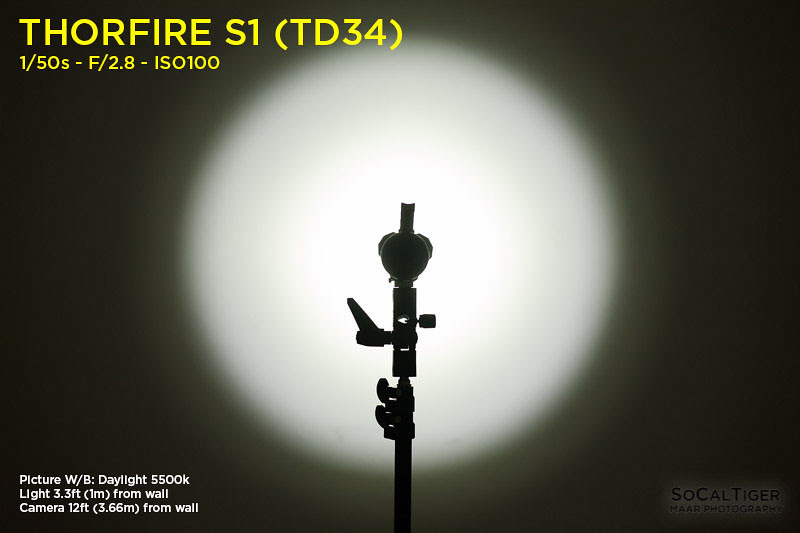 The S1 has a soda can body mated to a stylish triangular head with 3 distinct emitters utilizing domed Cree XP-Ls. Output is speced at a max of 2000 lumens (I measured 2100+ lumens.) 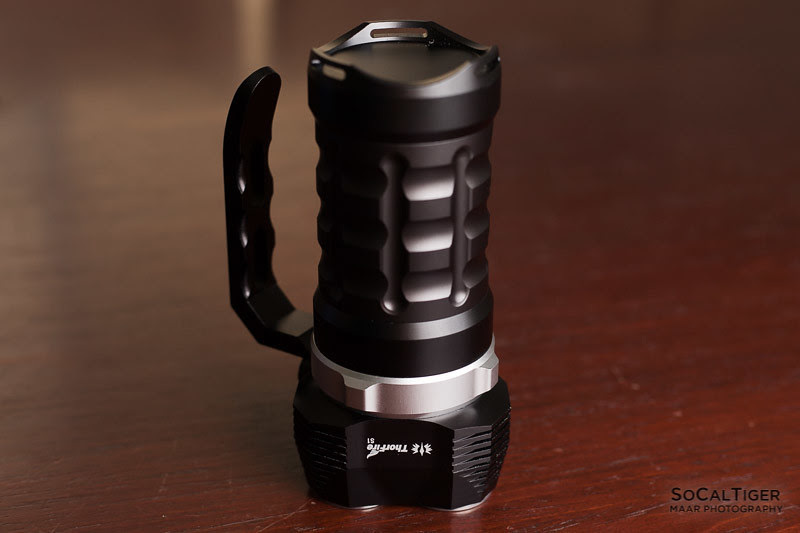 This is a really cool looking light which can be used as a lantern-style light outdoors, a scuba diving light up to 70m under-water or for re-creating scenes from your favorite Sci-Fi movies. 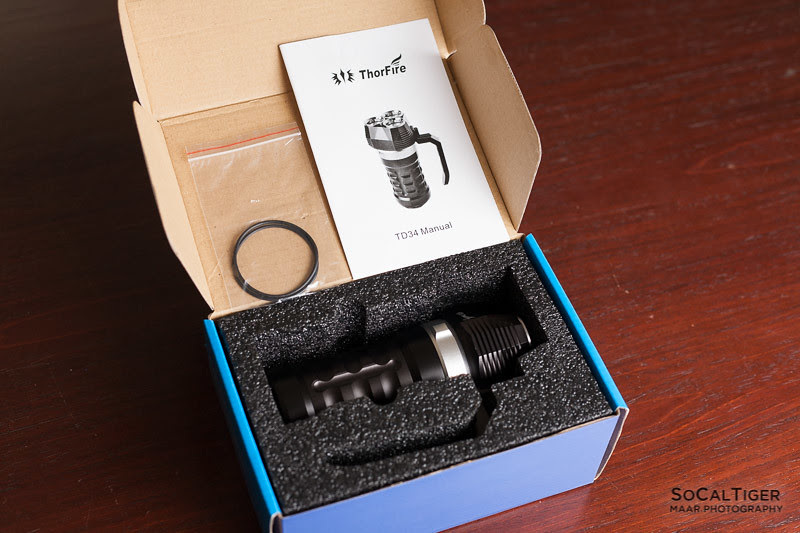 I had the opportunity to evaluate the Thorfire S1 and was provided a copy for review by Thorfire. 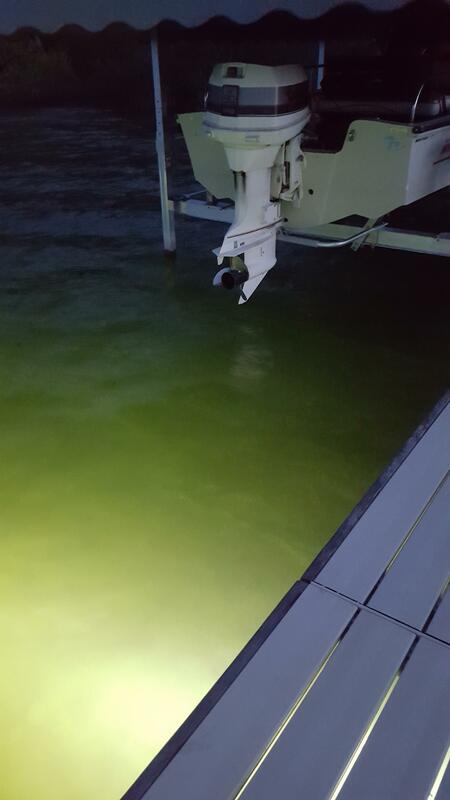 NOTE: The light was tightened for diving test. Please find a helper if you find it difficult to unscrew the light. 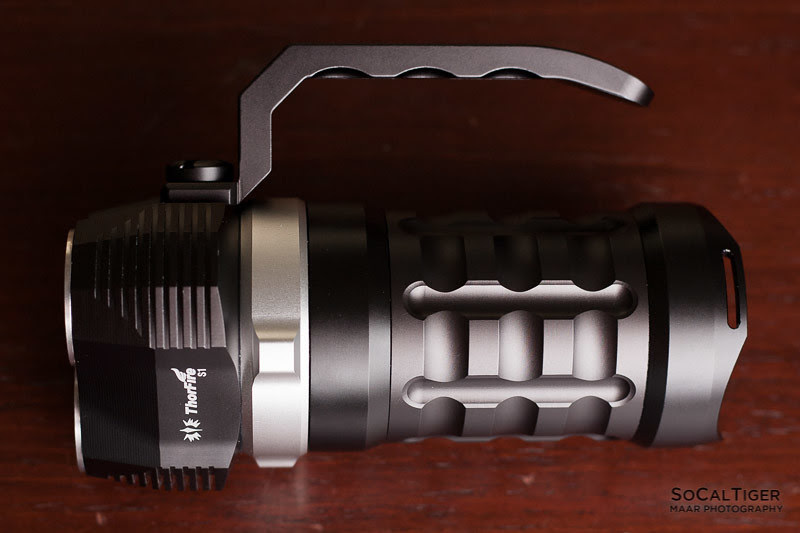 This Diving Flashlight is an extremely versatile, Super Bright. The max diving depth is 70m under water. It is fit for diving and scuba. Designed for the professional divers or under water Photographer. 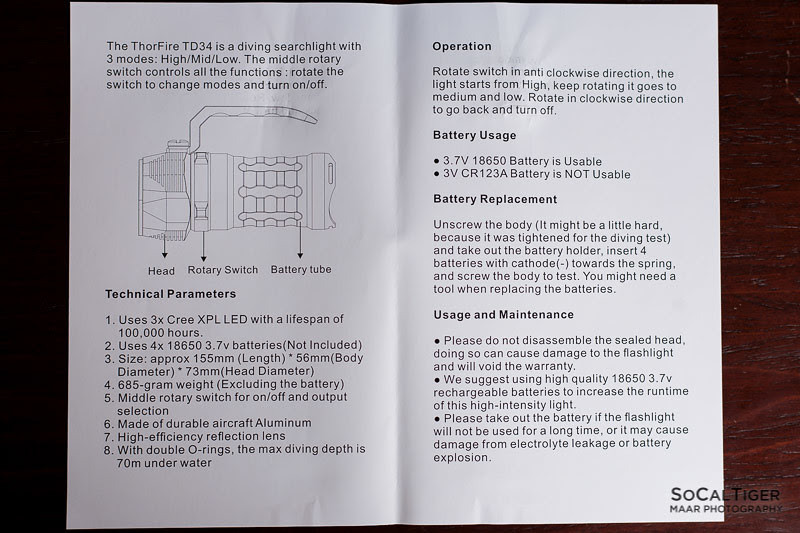 NOTE: Every flashlight passed our test under the same pressure of 100m underwater. The middle rotary switch controls all the functions, rotate switch in anti clockwise direction, the light starts from High, keep rotating it goes to medium and low. Rotate in clockwise direction to go back and turn off. Easy to be controlled by operation of user. It is make out of durable aircraft-grade aluminum body. The handle is wide enough to hold on, very comfortable and convenient. It is mainly used for diving works, Underwater fishing operations, Salvage operations Underwater archaeological work, Teaching Scuba diving. Also it is an ideal choice for outdoor activities, Such as fishing, diving, swimming, hiking, sailing, caving, hunting and seeking survival without fear of rainy days. The S1 arrived in a nice cardboard box which is both colorful and sturdy. The S1 was slotted into a cut-to-fit foam outline which perfectly protected the light from movement and damage. There were also 2 spare O-rings and manual in the box. The packaging is very good and protected the light. There is no notable risk of damage or scuffing to the light during delivery using this packaging. This packaging is much better than most lights. 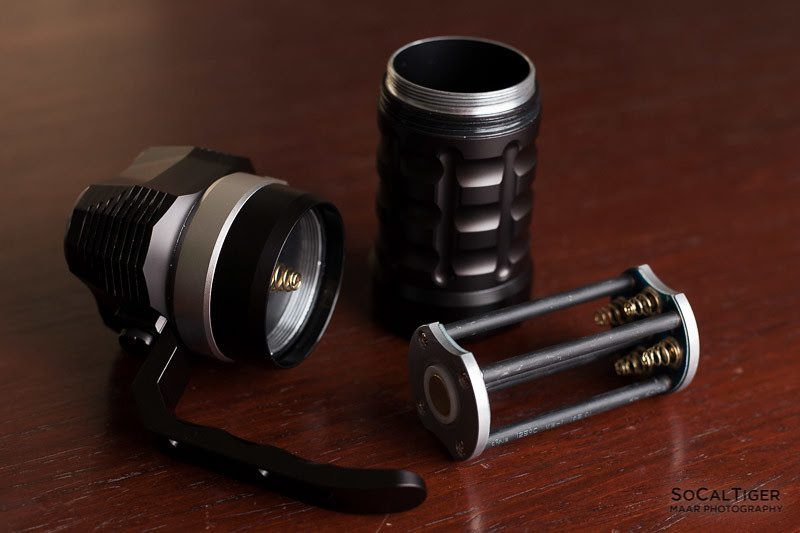 The S1 has smooth black anodizing. The anodizing was applied well and my copy did not have any notable defects in the finish. 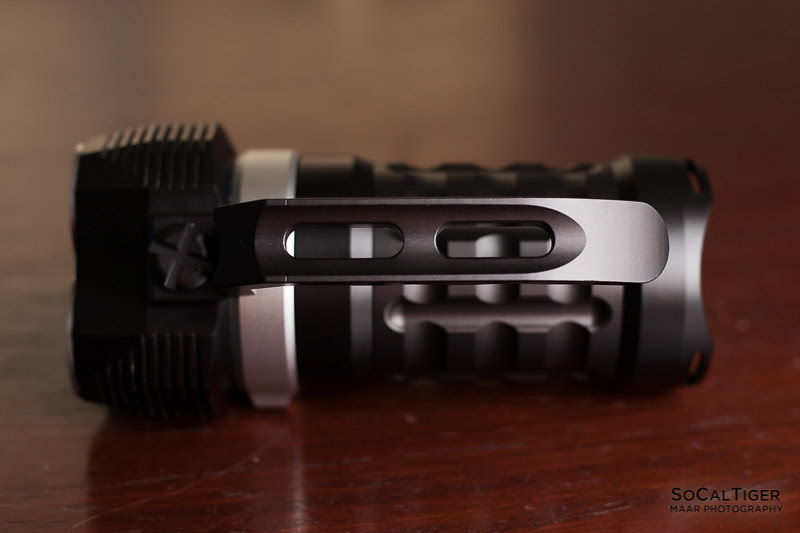 The anodizing has a nice smooth low-gloss look to it which is different from most ThorFire lights. I feel that this finish looks very nice and professional in quality (cheaper lights have an overly glossy or painted-on appearance). The body of the light is a "soda can" design. The head is triangular and has 3 distinct emitters. 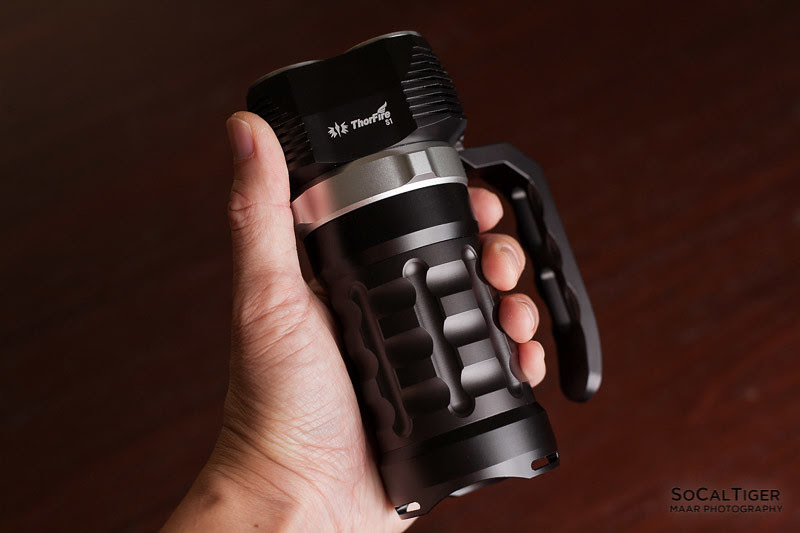 Due to the design, this light is extremely roll-resistant especially with the handle attached. The body has a nice even pattern which adds grip. Comment: I think that the head looks really cool like something out of a Sci-Fi movie. I've always loved the look of lights with distinct emitters. Weight without batteries is 629g (~22oz). The S1 comes with a handle pre-attached. I found the handle to be the perfect size for my size medium hands. People with large hands/fingers may find the handle a little short, especially with thick gloves. The handle is detachable with a large screwdriver. Mine only required moderate force to break the tension on the screw when using the proper tool. 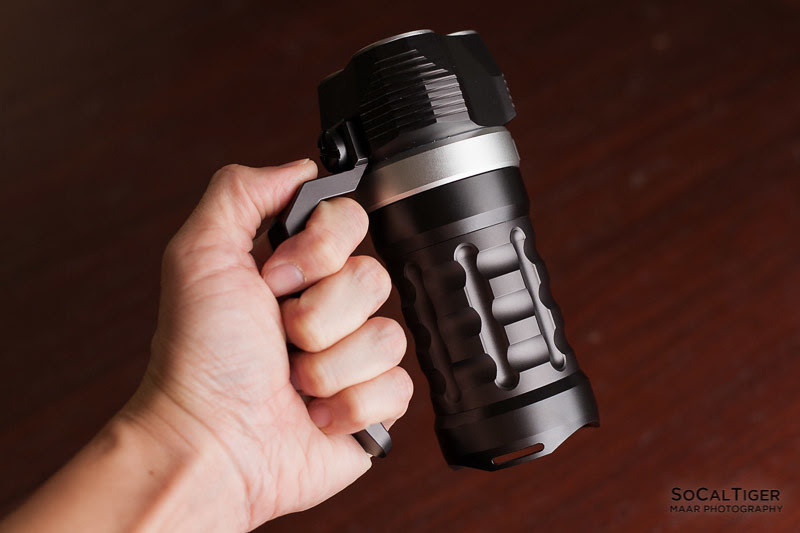 Removing the handle allows the light to be used like a soda can light. In addition, with the handle removed, the output control is very easy to use with one hand. Removing the handle leaves the attachment hole open. Comment: It would be a nice addition if a rubber "plug" was included for people who wanted to use the light with the handle removed. 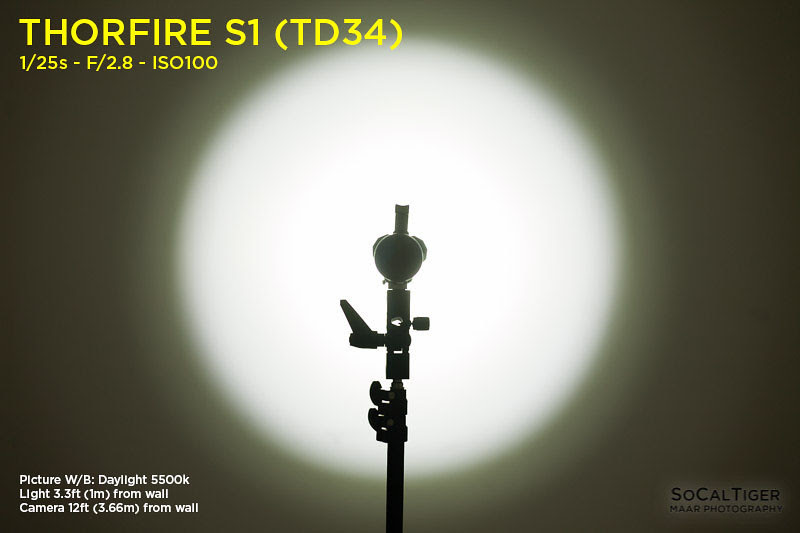 The S1 has no problems tail-standing and is exceptionally stable due to the large size, weight and stance of the light. 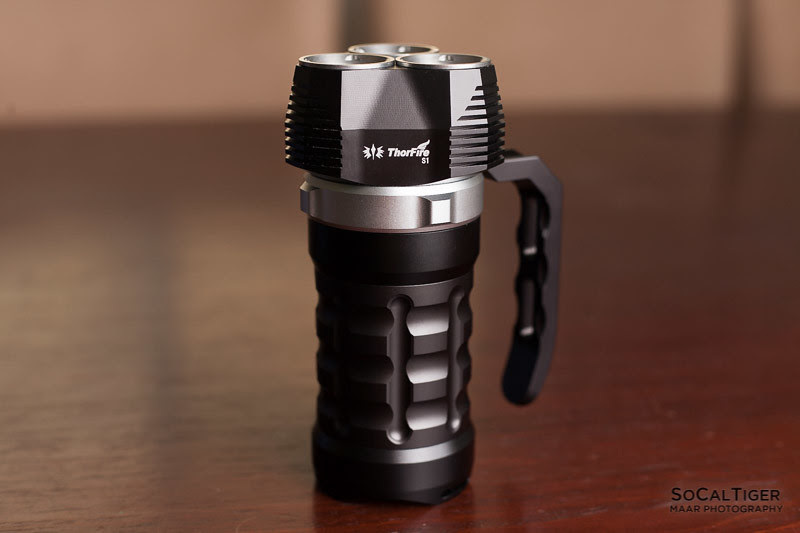 The light is controlled with a magnetic ring around the base of the head. Starting from "Off", the ring is rotated counter-clockwise (Off -> Low -> Med -> High). The ring on my light was relatively smooth (I did not find it to be "gritty") and it performed exactly like I would expect a magnetic ring to work. The ring slides nicely into place for each of the 3 modes. To turn the light OFF, rotate all the way back clockwise. Comment 1: This is my preferred order for larger/brighter lights (starting at low). The mode spacing is fine for diving and having just 3 modes keeps things simple. Comment 2: With the handle on, the mode control is primarily a 2-handed operation. However, it is possible or use the mode ring with 1-hand from the handle with a little balancing. 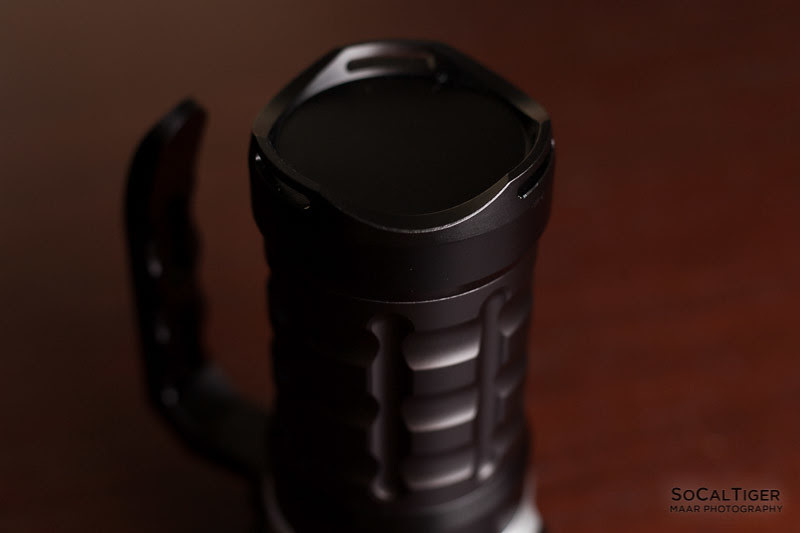 With the handle off, or if holding the light by the body, the mode ring can easily be rotated with 1-hand. Measurements were done using freshly charged EVVA protected Panasonic 18650Bs using a quasi-integrating sphere. I estimate High exceeds spec at roughly 2500+ on activation and 2100+ after 30 seconds. Medium is 1300+ after 30 seconds. Low is almost 500 lumens. Relative output is 100% -> 62% -> 22%. 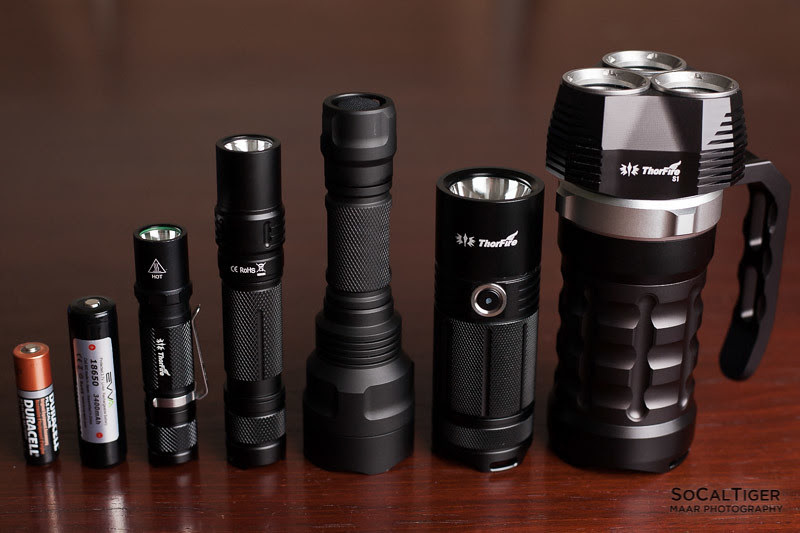 Comment 1: For land use, I would have liked 5 modes with a Low at 40-80 lumens and a Low-Low at 1-4 lumens for this size light. Understandably, you would not want the lower settings when diving and they might cause confusion underwater. 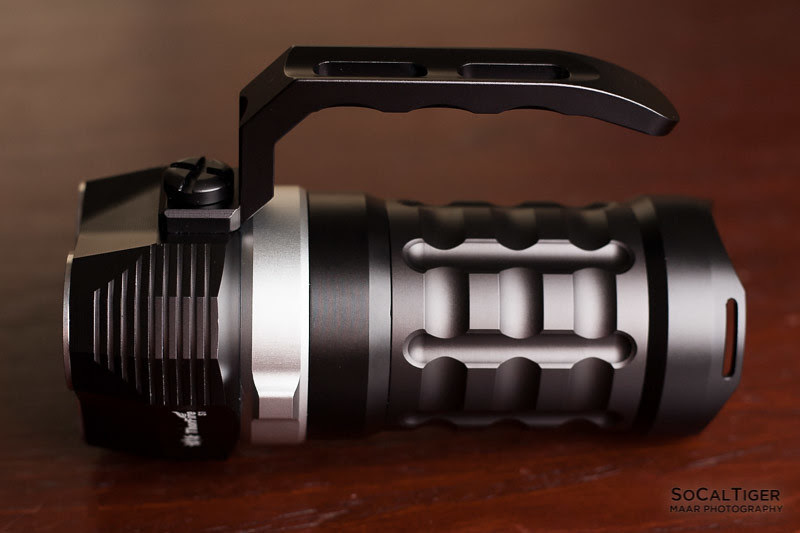 Comment 2: It would be cool if ThorFire made a version of this light intended for land use (more modes, lighter, less tight threads and easily removable handle with plug). General purpose. 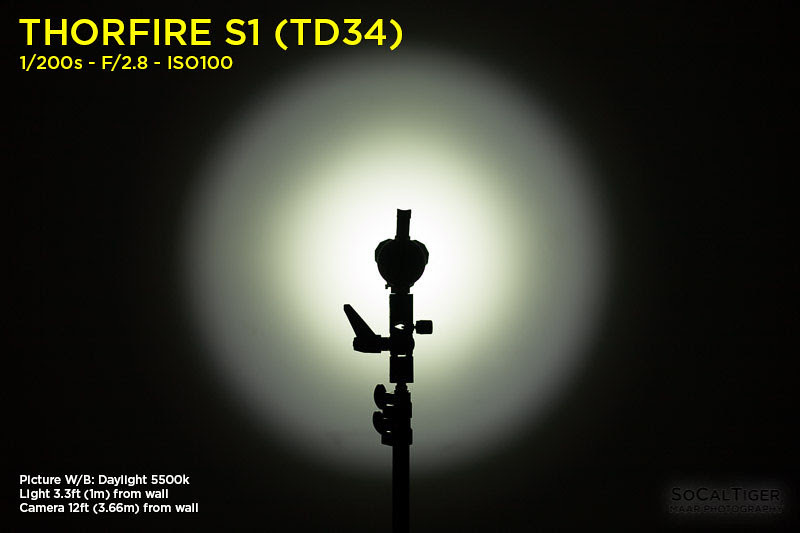 The S1 uses 3 domed XP-Ls combined with distinct polished reflectors. The beam is very balanced for general purpose use with a large, almost uniform, hot spot which transitions smoothly and gradually throughout the beam. The beam has defined edges. This light works very well for people seeking a more balanced beam. 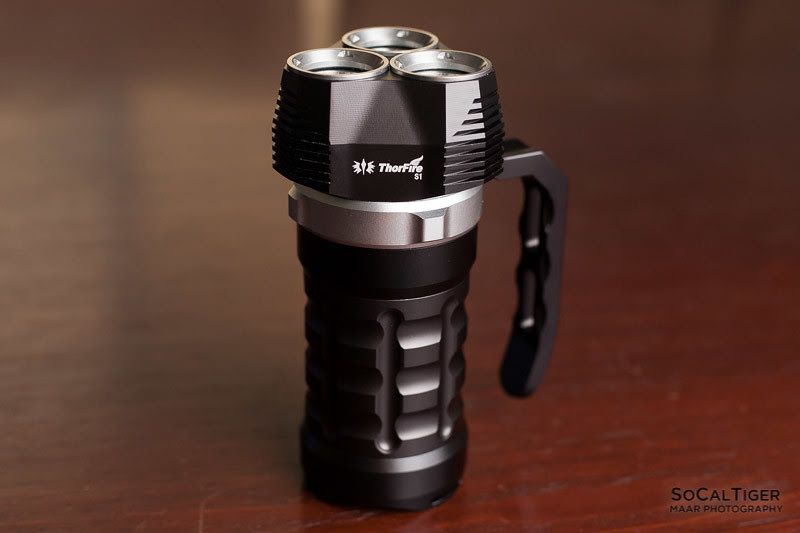 This light works great for general purpose use underwater, indoors and outdoors. In practice, I find this to be a well balanced beam. This will contrast with a dedicated thrower in that it is better suited for general outdoor or underwater usage. This is the type of pattern which I would normally use for a hike or walk and should also be good for diving. Indoors or close-up, a flooder is preferred. The color temperature is ~5750K (cool neutral) using Lightroom's Auto WB. When white-balanced in Adobe Lightroom against "Daylight 5500K", the beamshots appear neutral. The light appears pure white in practice and this is a good choice of default color temperature. In Lightroom, the color has a green shift of approximately 20 points from Daylight WB but this was not noticeable to me in real world usage. Personally, I would love if they also had an option for a warmer tint in the neighborhood of 4000-4500K. A warmer color temperature when used underwater would decrease the rate of refraction. Higher color temperatures have more refraction and will exhibit more "bounce back" in either foggy or murky water conditions. 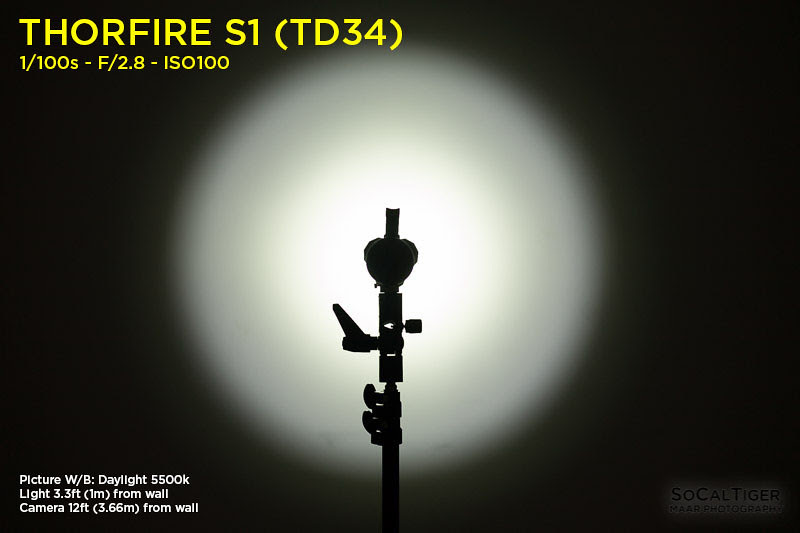 The ThorFire S1 is powered by 4x18650 batteries (Li-ion INR, ICR, IMR, etc.). Protected Batteries Fit. The EVVA Protected Panasonic NCR18650B fits fine length-wise at 69.5mm and width-wise at 18.67mm. The fit was a little snug length-wise. The battery carriage is 4p so 1, 2, 3 or 4 batteries can be used. Even though fewer batteries can be used, I personally recommend using no less than 2 good batteries. 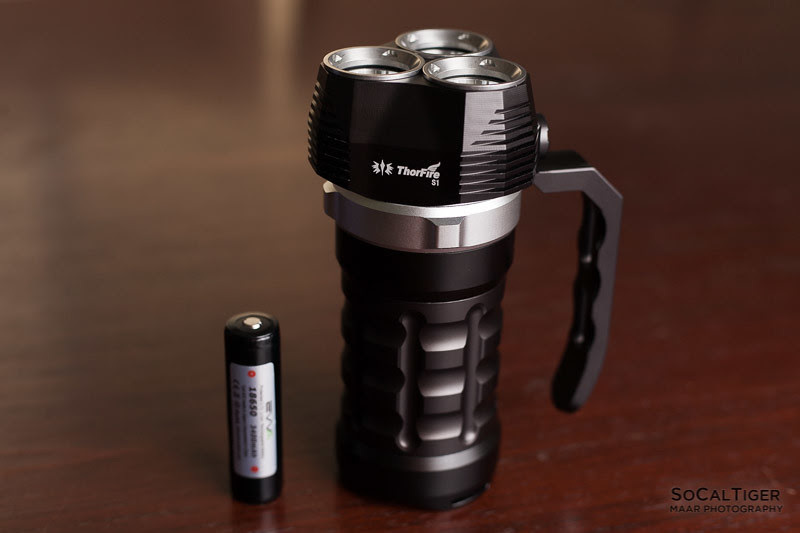 This light uses around 6A (ballpark estimate) on High so using at least 2 batteries will ensure enough current can be provided and also put less stress than on a single battery. I also prefer using protected cells in any multi-cell light in addition to good li-ion battery care and maintenance. As with any multi-cell light, use caution to ensure that all batteries are inserted the correct direction or you may create an immediate short. There is no physical or electronic lock-out and the switch is relatively easy to turn. 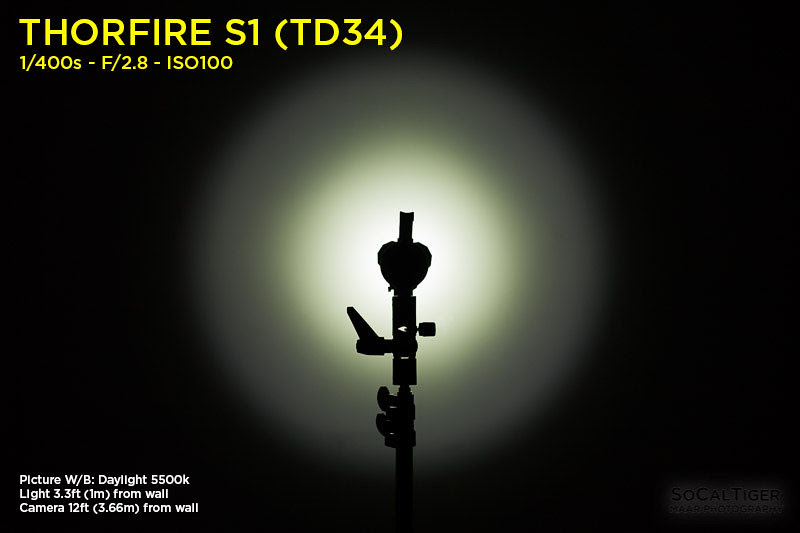 ThorFire S1 pictured next to other lights for comparison. 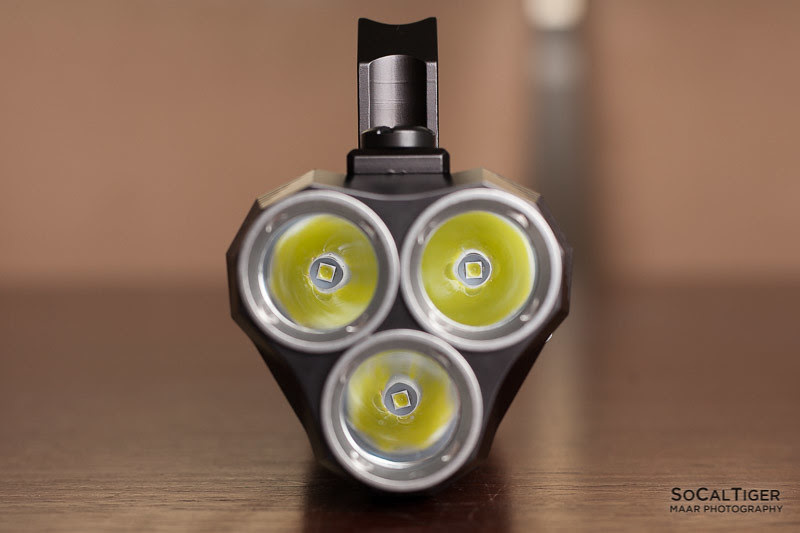 This is a cool-looking 3xXP-L diving light with 3 modes which produces 2100+ lumens on High. I really like the Sci-Fi look of the triangular head and 3 distinct emitters. This light is meant to be used primarily for diving but it can also be used on land outdoors like a lantern although it is relatively heavy. 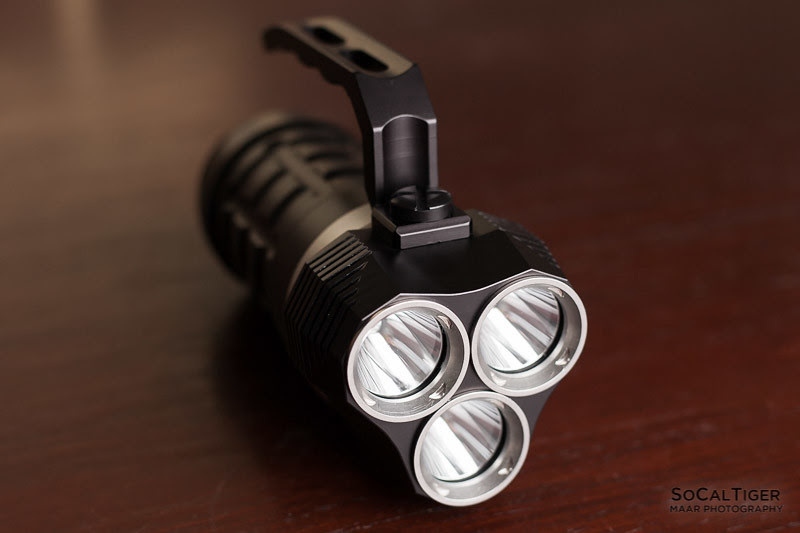 Due to the large amount of metal, this light absorbs a good amount of heat and when used for diving as intended, heat would not be an issue at all even on High. The finish looks great and is a nice smooth low-gloss anodizing. My copy had no notable finish defects. 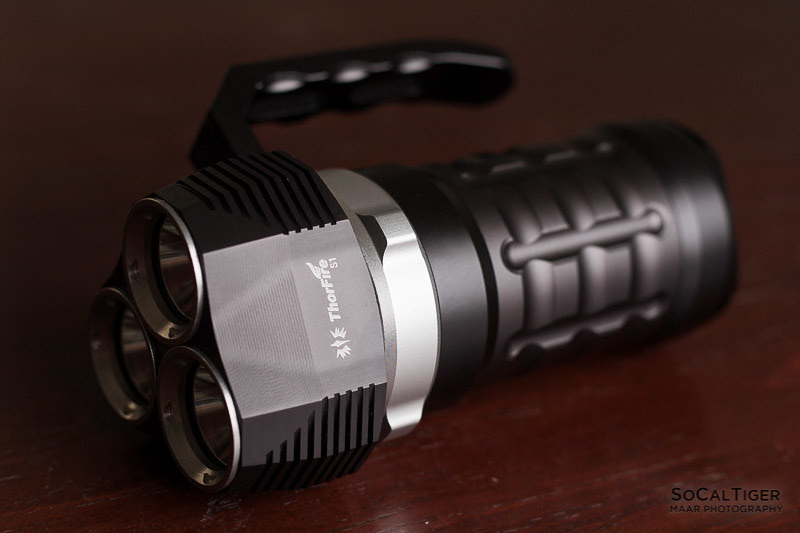 The light uses 4x18650 lithium-ion batteries and protected batteries like the EVVA protected Panasonic NCR18650B fit. I prefer using protected batteries for multi-cell lights. The brightness is controlled with a magnetic ring around the base of the head. Starting from "Off", the ring is rotated counter-clockwise (Off -> Low -> Med -> High). The mode spacing is good for diving and having just 3 modes keeps things simple. 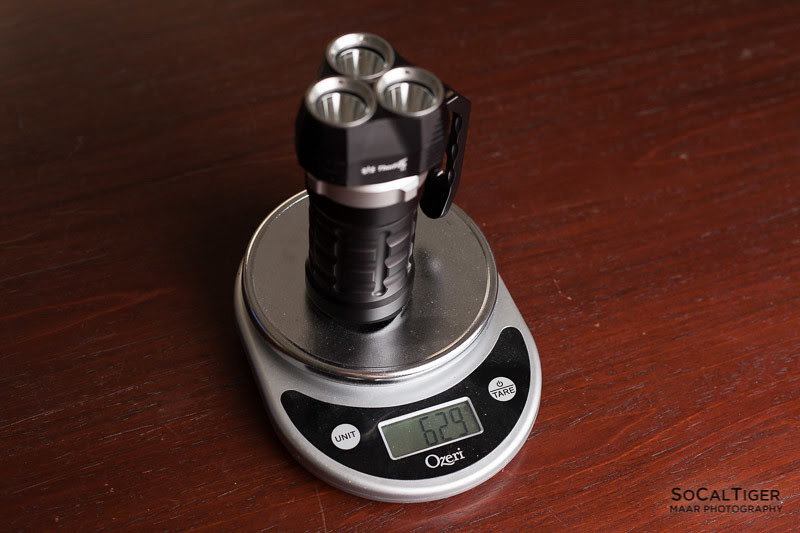 For land use, I would have liked 5 modes with a Low at 40-80 lumens and a Low-Low at 1-4 lumens for this size light. 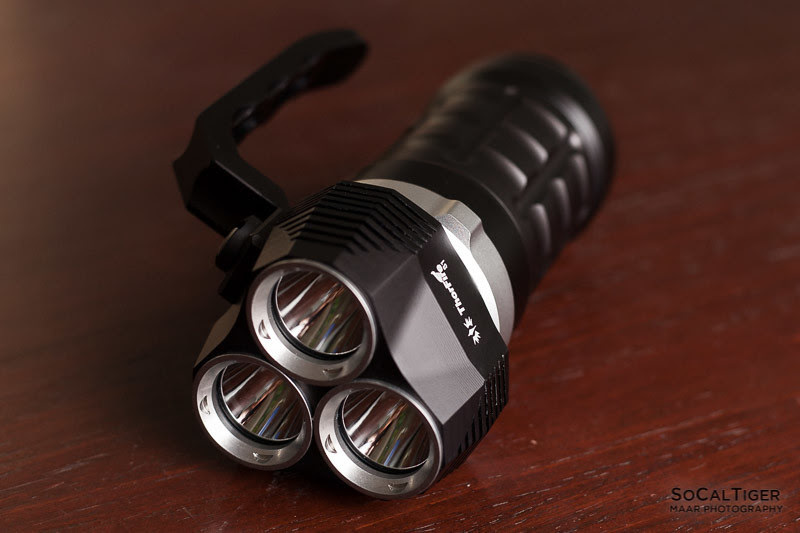 The beam profile is general purpose and well-suited for diving and general outdoor usage. The color temp is 5750K (cool neutral). It would be great if there was a warm to neutral white option as a warmer temperature would provide better visibility in murky diving conditions or foggy outdoor weather due to lower refraction. 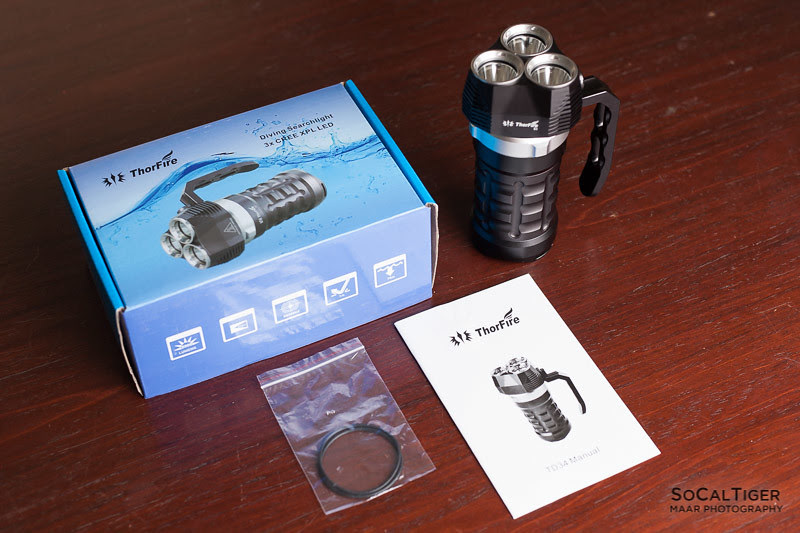 The threads mate tightly and allow the light to be used at up to 70m underwater although screwing/unscrewing the light takes more force than non-diving lights. nice review! thanks for posting! I’ve been using mine as a fish attracter. Tie a line to the handle and toss it overboard to about 15ft. Going to try tying it to a round buoy to point straight down from the surface. Oooh… this actually occurred to me although I didn’t try it. Good to know. That would have made the beamshots easier than precariously balancing it on my light stand haha. 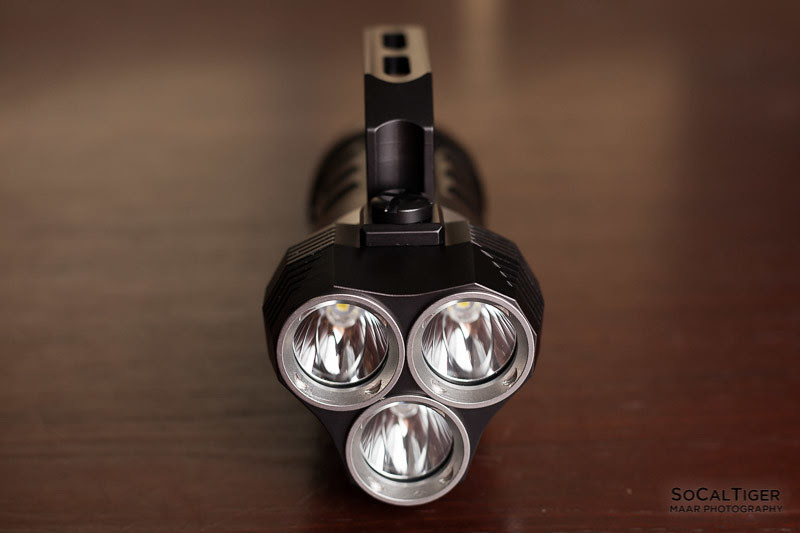 Now that’s an innovative use for a flashlight! I left it underwater for 12 hours to see if it would leak. Left the light on for an hour, pulled it up off the bottom, shut it off, and tossed it back in until the next day. Dry as a bone. I guessing that it will although not quite flush since the S1 handle has a rectangular protrusion at the attachment point which is meant to mate with the opening in the S1. Speaking of the Q8, has anyone weighed the prototypes? I didn’t see weight listed on the first page.